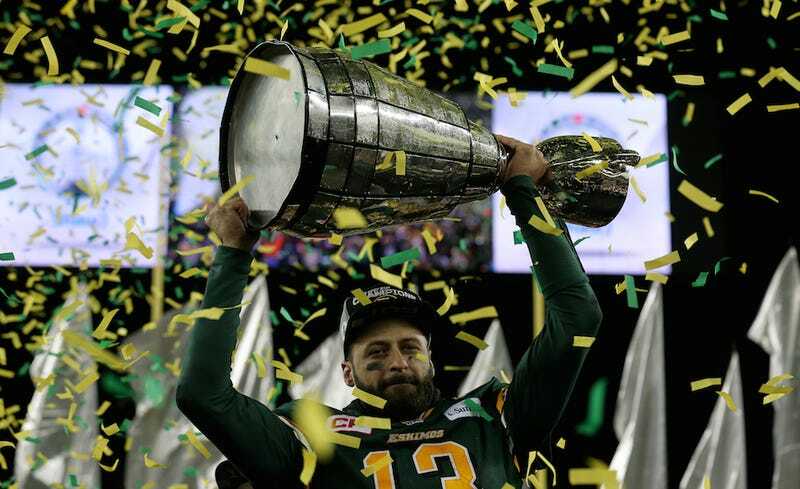 The Edmonton Eskimos defeated the Ottawa Redblacks 26-20 Sunday and won their first Grey Cup since 2005. Here’s where we’d say you wasted your time watching another week of regular-season NFL, but the 4 p.m. Steelers-Seahawks game was pretty damn good. The Grey Cup was good, too. Edmonton crawled back from an early 13-0 deficit to take a 17-16 lead into halftime. Ottawa’s field goal and a trade of rouges—here’s an example of a rouge—gave the Redblacks a two-point lead, but Jordan Lynch, the former Northern Illinois quarterback who tried converting to running back for the Chicago Bears but didn’t make the team, scored the game-winning touchdown on a one-yard dive. A two-point conversion sealed Edmonton’s championship. If only the Grey Cup had happened tonight. I would have absolutely watched it over the second-half preseason game that will be tonight’s Ravens-Browns matchup with Josh McCown and Matt Schaub.